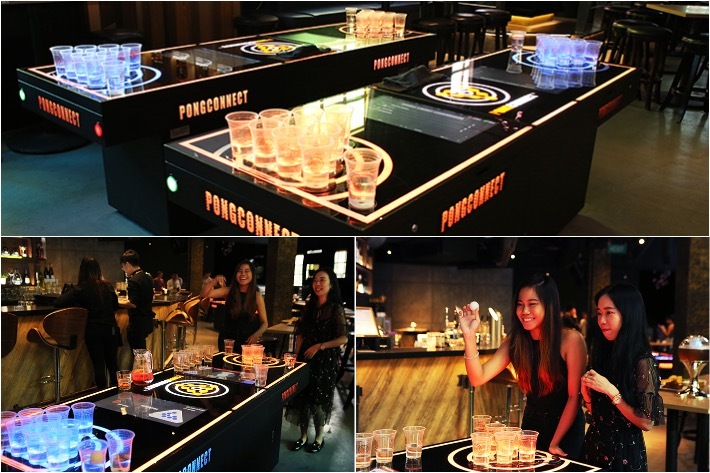 Adopting the latest PongConnect™ technology, the very same one that has been making waves in Hong Kong, Taiwan and China, every beer pong game at PONG Singapore is guaranteed to be a fun and action-packed experience. While it is not entirely compulsory—unless you’re the competitive type—players can download the ‘PONGConnect’ App that integrates with the table itself. The app automatically synchronises with the table and updates player’s scores and leaderboards live, allowing users to compete on a global scale. When it comes to hearty bar grub to take the alcohol edge away, nothing beats sinking our teeth into one of PONG Singapore’s signature delights, their oh-so-scrumptious Beef Sliders (S$23 nett). Essentially a mini burger that’s small enough to slide down one’s throat in a jiffy—hence the name—these beauties of thinly patted ground beef, caramelised onions, cheese, mayo and cornichons are just the perfect thing to indulge in along with drinks. With just the right combination of ingredients to achieve that fine balance of umami, savoury, sweetness and a hint of tartness on the tongue, we dare say this is one of the best sliders we have ever tasted. They were really that good. On nights where you’re knocking back one too many beers, it will probably be a good idea to offset all the excess alcohol with something with a little heat. 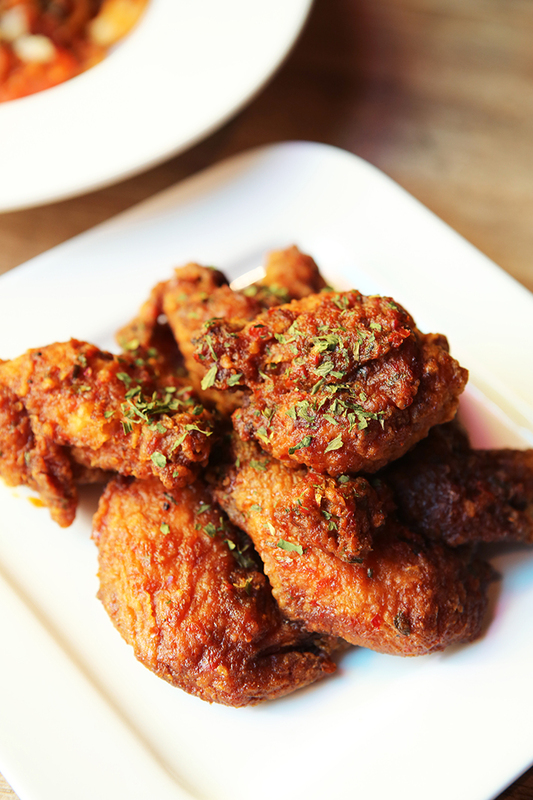 Which is why more often than not, bars would typically have some form of spicy wings. Here at PONG Singapore, you absolutely have to order a plate of their Devil’s Wings (S$12 nett). Every wing boasts a fiery kick with a stickily sweet and savoury flavour. What’s a cold one without a bucket of fries to go along with it? While it may rank pretty similar to many other versions we have tried, their Truffle Fries (S$12 nett) is a sharing item that we will never say no to. These truffle-infused shoestrings boast a delightful crunch with just the right amount of salt. Brimming with the delicious oceany flavours of fresh shrimp, mussels and squid, the Seafood Pomodoro (S$20 nett) was truly a joy to eat from start to finish. The pasta was cooked just slightly past the point of al dente, allowing each individual strand to have a nice firmness to it but still being soft enough to slurp up. The various seafood components complemented the sweet and mildly tart tomato sauce perfectly as well. Their Beer Battered Fish & Chips (S$28 nett) comes with a generous serving of rustic, thickly-cut potato chips, a generous serving of mushy peas and a massive battered cod fillet. On the side, you get a tray of condiments featuring the likes of malt vinegar, ketchup and salt—just the way the Brits do it. Delightfully crispy, the lightly battered exterior was neither oily nor overly doughy. Eaten with a sprinkling of salt and some malt vinegar, this dish blew us away. Another great item for sharing while drinking is pizza. Texturally, it hits all the right spots from the ultra crispy layer of dough to the meaty and crunchy components that work well together to form the perfect bar snack. There are several hand-rolled pizza varieties to choose from but we decided to go with the Proscuitto (S$21 nett) that encompassed classic Italian flavours. This Italian pie came loaded with prosciutto, arugula, tomato, shaved parmesan cheese, pesto as well as a sweet balsamic glaze drizzled over top. Struggling to decide on which pizza to get? Then opt for a Half & Half that includes 2 halves of 2 hand-rolled pizza varieties. For ours, we got the Wagyu Beef (S$22 nett) that came highly recommended as well as the Smoked Duck Breast (S$22 nett). Both boasted nice textural elements to them as well as a multitude of differing yet pleasant flavours. The former pie takes on a Japanese influence with bonito flakes, seaweed, a Japanese wine cream sauce as well as, of course, Wagyu beef. Savoury, sweet and brimming with umami notes, this is one that we highly recommend. The former was just as meaty and delicious but the real money-maker for us was the addition of crispy wonton skins. 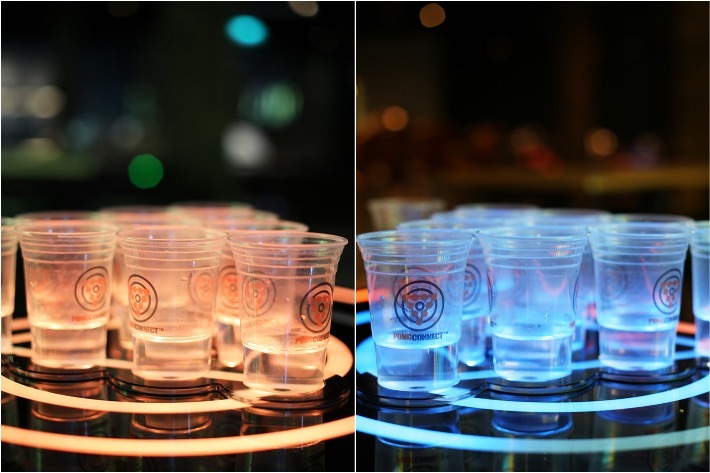 Compared to many of the bars that we have been to, PONG Singapore is one of the few that exceeded our expectations where service was concerned. The wait staff were attentive and extremely hospitable and the bar itself boasts an exquisite setting and the bustling nature of the bar once the crowd comes makes it a great place to have fun together with your friends and colleagues. 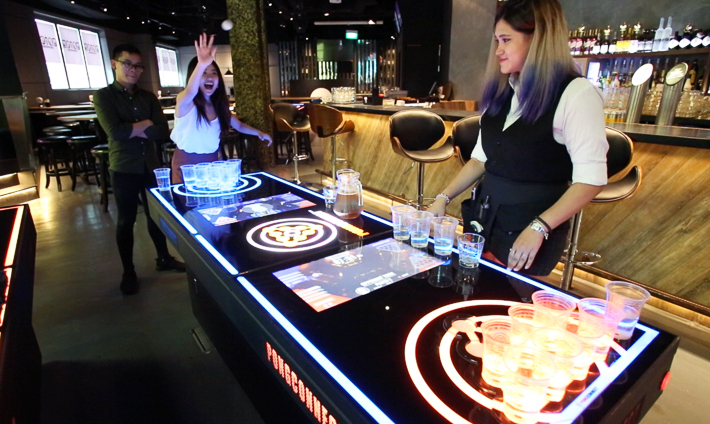 Whether you fancy a pint or a tower of lager, a glass of Champagne or even something a little more personalised like a hand-crafted cocktail, you are sure to get yourself well sorted here at PONG Singapore. This post is brought to you by PONG Singapore.